On Friday’s Grimm, Nick and Hank’s case involves a samurai looking furry wesen, while a lot is going on with the various conspiracies among the wesen world of Portland. Spoilers after the break. The episode starts with some origami, a dog-shaped one to be specific. This is left as a calling card in the home of a teenager who seems to have shut himself off from the world and even his friend who keeps trying to call, and even shows up at his house while his parents are out. He turns his away and goes back to his gaming. Until he sees the origami and then is knocked unconscious by a wesen. He wakes up to find himself buried up to his neck in some sand by the shore, and this is the last thing he sees. Also at night, Nick meets with Eve, either by choice or she just showed up in his truck. She fills him in on what she learned while she was Renard, after “sleeping” with Rachel (quotes because she had performance issues, probably for the best). He might not have known they were involved when Dixon was assassinated, but Renard is aware now that he’s working with Black Claw. She also warns Nick that Adalind’s hexenbiest suppressant is about due to wear off so he should watch out for that. And speaking of Renard, when the real one has a hook-up with Rachel, she makes a comment about how he made up for last time, which he of course doesn’t understand. When Nick tells Monroe and Rosalee about it, Rosalee spills the beans that Adalind had regained her powers when Tony visited the spice shop while the guys were in Germany, and that she used those powers for good. Also, pretty cool when she broke that jerk’s hand, one finger at a time (my opinion, not something she says). Rosalee convinces Nick to allow Adalind to tell him instead of confronting him about it, especially since doing so could cause trouble. Adalind does let Nick know she has something to tell him, but it’s that she’s going back to her old law firm because she’s ready to start working again. So she shows up with Kelly, and it turns out her old boss is also a wesen, a lausenschiange (lizard-man), and her being a hexenbiest was one of the reasons she was employed there to before. He asks if she’s still able to work in her capacity as a hexenbiest, and Adalind woges for the first time since that suppressant started wearing off. Kelly seems to be able to see them woge, and is not the least bit scared, in fact he seems happy with his mom does it, so since it’s too early to have Grimm powers, it’s gotta be because he’s a half-zauberbiest. And while Adalind is at her job interview, which seems more a formality for a sure thing, Nick has asked Monroe and Rosalee to check out the tunnel under his new home. He hasn’t had a chance because Adalind is always home and now that he knows she’s a hexenbiest again, he doesn’t want her knowing any more than she already does. So he draws them a basic diagram, and they go exploring. They make their way down a shaft, and find a tunnel, and then find a skeleton and decide it’s time to turn back around. But when they get back, they find that Adalind is back home. And then Eve makes a surprise visit. She assures Adalind she’s not there to kill her, although Juliette might have. Then she tells her that Black Claw is going to approach her at some point and that she shouldn’t work with them. When Adalind asks why, Eve says because they’ll want a hexenbiest on their side, and when Adalind denies being one, Eve calls her out as a liar. She then says she doesn’t blame her, having a baby makes her vulnerable, but if she hurts Nick, Eve will come after her. Monroe and Rosalee get to hear all of this, while trapped in the corridor. While this is going on, Nick and Hank have been called about a severed head found under a bridge, belonging to the angsty teen from the start of the episode. Wu finds only one missing person report from the night before so they go to the house and confirm the boy’s identity and then inform the parents of what happened. Nick also finds the origami dog under the couch. The then father angrily says he knows who did it, Jin Agaki, the father of another boy, Kuma Akagi, who was accidentally killed by the now dead teen and his friend who kept calling him. It seems his angsty behavior may have been from guilt. 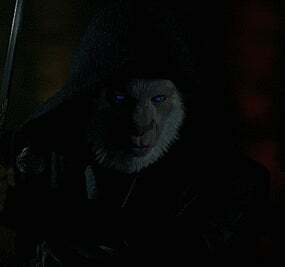 He goes to confront Jin, and is attacked by a wesen. Nick and Hank show up to find him unconscious and have to take him in since he entered the home and attacked the Akagi couple. He describes what he saw, chalking it up to his grief, cluing Nick and Hank into some wesen involvement. Jin Agaki then shows up with his attorney Takeshi Himura, who has an alibi for his client on the night the boy was killed, and also says he won’t press charges on the father as he’s been through enough. Nick and Hank then bring in the dead boy’s friend, who tells what really happened the night Jin Akagi’s son died. It turns out he had brought over a sword from his dad’s collection to show off, then the other boy brings out a gun his dad owned, that he got from his grandfather, and apparently it was loaded and it shoots the Agaki boy, who woges and freaks out his friends, who drop the gun, which goes off and shoots him again. Now Nick and Hank know the Akagis are wesen and go confront them. Nick tells them he knows they’re wesen and that he’s a Grimm and they need to talk. After the usual freakout about him wanting to kill them, they go inside to talk. When Nick tells them the dead boy was buried up to his neck and decapitated, they tell him the ritual sounds like that of the inugami, or ghost dog, also a wesen, but one sworn to protect a specific family. They figure out it’s the attorney Takeshi, who owed a debt to Madoka Agaki’s father, and was getting vengeance for what happened to their son. They find that the other boy has now been taken, and everyone rushes back to the same bridge they found the first one under, which turns out to be a good guess, as Wu confirms that’s where they tracked his phone to. Here’s a clip of the fight to stop him from killing again, as well as the resolution (sort of) to Monroe and Rosalee’s situation, and why Renard was really willing to work with Black Claw. Nick fights the Inu (dog) not rabbit (usagi) samurai, or yojimbo as they might be called, and fights him well enough until Hank has a gun on him and reads him his rights. Nick then gets a text from Monroe asking for help getting out from under his home. And Renard is greeted at his home by Rachel, who has a surprise for him. It’s Diana! But she’s grown, and Renard almost can’t believe it’s her, so she does her purple eyes thing, and Renard has a very happy look on his face to be reunited with his daughter. Except now Black Claw has someone they can use against him. With Diana back, there’s a strong chance Renard can get Adalind on his side, but he really needs to tell Eve he only did it to get his daughter back so she doesn’t kill them. And so Adalind doesn’t leave with Kelly. So maybe there’s a wesen version of him too. Inu is Japanese for dog, and kami is spirit though usually not used for ghosts, so ghost dog is a slight stretch, but pretty close. The Akagi are kitsune, which are fox wesen. And their son’s name, kuma, is a Japanese word for bear. Wu Werewolf Watch - second entry: Wu has a weird dream where his bathroom door opens to a forest and he runs off into it. Then he wakes up the next morning and his bathroom door leads to his bathroom, which looks pretty nice, so it must have been a dream. Or was it....? He also has a headache while leading Nick and Hank to the headless body buried in the sand. Maybe we’ll get something from this at the finale, right when they could use some lycanthrope help against Black Claw. And he’ll be the second human from the group to be turned into a wesen, but hopefully he’ll end up better than Juliette.